Nate Pearson missed essentially all of last season, so his top priority in 2019 is staying healthy while keeping in form. So far, he's checked all the boxes -- and then some. 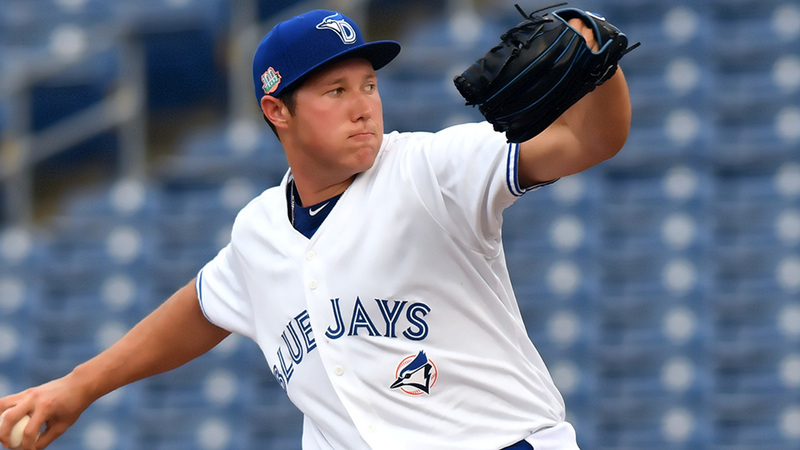 The fourth-ranked Blue Jays prospect recorded a career-high nine strikeouts, allowing one hit over five scoreless innings to pitch Class A Advanced Dunedin to a 5-2 win over Bradenton on Sunday at Jack Russell Memorial Stadium. He lowered his ERA to 0.75. "I was feeling pretty good. It's always good to have a healthy outing, especially missing all of last year," Pearson said. "I'm just trying to find my groove this year, stay healthy and make my start every fifth day. That was a pretty good one today." Taken in the first round of the 2017 Draft, the right-hander wasted no time acquainting himself to Class A Short Season Vancouver, striking out 24 over 19 innings while putting up a 0.95 ERA. As he prepared for his full-season debut last year, back tightness delayed things until May 7. In his start against Bradenton that day, more bad luck befell Pearson (2-0) when he took a line drive off his right arm, fracturing his ulna. His regular season was cut short, but the Florida native returned for a stint in the Arizona Fall League, throwing 20 1/3 innings for Surprise. He had a 6.20 ERA in six starts but still struck out 23. Back in the FSL this season, Pearson allowed one run and kept a stingy 0.71 WHIP over his first seven innings on the circuit. To make starts every five days has been a positive step after his roller-coaster 2018. The AFL experience also allowed the right-hander to catch up a little bit in a year that could have stifled his growth. "It's been a real blessing," he said. "I worked really hard to get back where I am now and I'm starting to see the hard work pay off. ... [The AFL] was good, missing all of last year delayed my development. I didn't get to throw off a mound at all, so it really delayed my development with my pitches. So the AFL was good to get out there and knock the rust off. I ended up hitting my stride in the AFL, and it turned out pretty good for me." Against the Marauders, the 22-year-old faced one batter over the minimum and threw 43 of 59 pitches for strikes. Pearson, who knew before the start that he would get five innings on the bump, set down the first 11 hitters before seventh-ranked Pirates prospect Cal Mitchell lined a single to right field to break up the no-hit bid. Working with a runner on base did nothing to shake Pearson, who fanned Lucas Tancas to end the frame. The 6-foot-6, 245-pound Florida native returned for the fifth and turned in another perfect frame, striking out Michael Gretler to cap a nearly impeccable start. "Today was one of my longer outings. I knew I had five innings to work with, so I tried to be efficient and that's exactly what I did," Pearson said. "It was good -- it's always good to end the game with a strikeout." Back where he was supposed to pitch last year, Pearson is grateful to have a clean bill of health after being on the shelf as long as he was. For him, being on the mound means things are going well. "Just to be healthy all year," Pearson said of his goals for 2019. "Just because I know when I'm healthy I'm at my best." Dunedin broke through in the bottom of the fifth to provide some insurance. No. 22 Blue Jays prospect Chavez Young belted a three-run homer and Logan Warmoth followed with a solo blast.